Conditions and Restores Leather Surfaces Great for Seats, Door Panels, And Dashboards Preserves the Leathers Strength, Durability and Appearance Formulated With Vitamin E Leaves No Residue UV Protection Great Leather Smell Boyds Vintage Leather Conditioner is a lavish lotion for your leather surfaces that penetrates deep into the leather to contition leather of all ages. Use Boyds Leather Conditioner to leave behind a silky smooth, dry-to-the-touch feel while also restoring the fresh, natural leather smell. Boyds Leather Conditioner preserves and protects leather from drying, cracking and brittleness that occurs naturally with age. 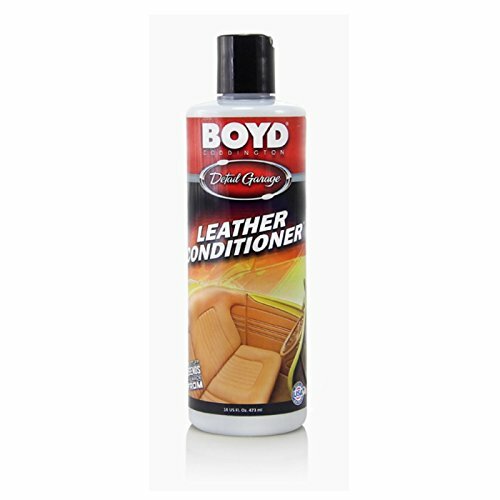 Boyds Leather Conditioner replaces essential nutrients that are depleted by regular wear and tear and from UV solar rays. Boyds Leather Conditioner is safe to use on all leather surfaces to nourish and keep the surface moisturized, thereby reducing the chance of brittle, dry and cracking leather. Boyds Leather Conditioner is widely regarded as the ultimate leather conditioner and is used by professional detailers, car collectors, classic car enthusiasts and owners of modern cars.